Keep your pet happy and healthy when you can't be there with this highly functional and useful programmable Pet Feeder with Message System. 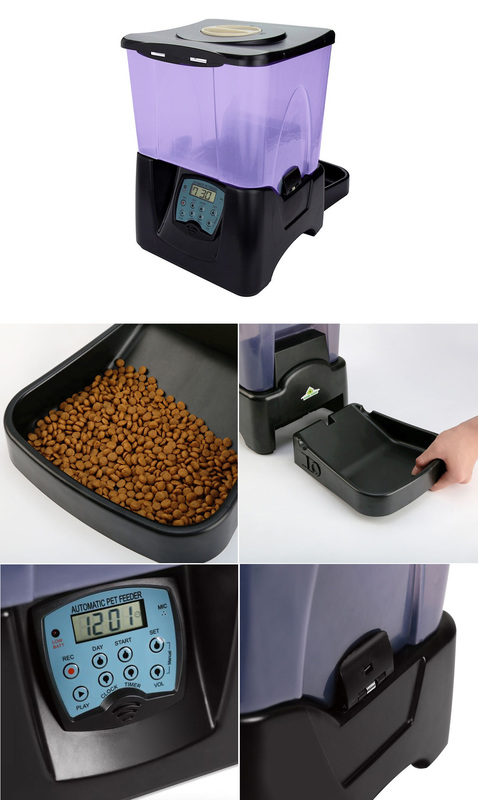 This Automatic Pet Feeder ensures they are always fed at the right time so you never have to worry if they are going hungry when you aren't at home. Comes with LCD display and keypad onboard for easy programming. Large enough to hold up to 90 meals and extremely easy to use. Pet proof lock to prevent accidental spills or your pet getting access to it. Anti-jamming design with a built-in smart sensor to ensures overloading in the feeding tray doesn't occur. See through design makes it easy to see when a refill is needed. Storage bin is detachable for easy cleaning. Our pet automatic feeders are not meant to replace human feeding.